The organ at St. John the Divine was built by George Fincham, and was originally erected in the North Fitzroy Methodist Church in 1921. It was rebuilt by Robert Heatley and erected in the Church of St. John the Divine as the Centenary Organ. It was officially opened and blessed on 3 May 1981. There have been various additions and improvements over the years. Within two years, a sixteen foot Open Wood Stop was added. 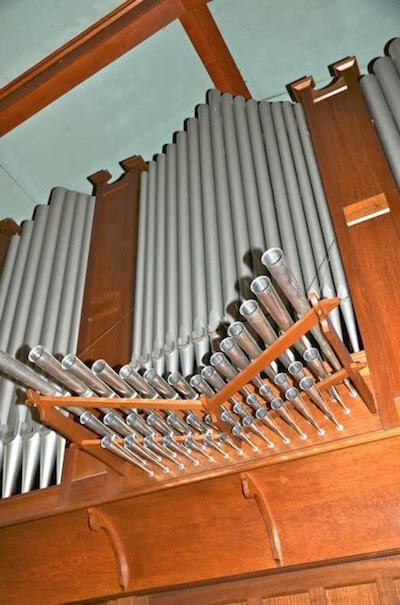 A three rank mixture stop to the Great Organ has been added, and on 1 May 1994, the horizontal trumpets were blessed. They were a gift of Terry Molyneax in memory of his wife, Iris, who was the first woman graduate in Organ at the University of Melbourne Conservatorium of Music. The organ may be classified as belonging to the English Romantic period. It consists of two manuals and pedals and has sixteen ranks of pipes. It is one of the finest instruments in the eastern suburbs of Melbourne. St John’s has a fine tradition of music and new members of the choir are very welcome.